We invite you to experience the majestic Smoky Mountains from the comfort of your very own log cabin. We all need to get away from the stresses of everyday life, and the vast skies and fiery sunsets have a way of warming your heart and lifting your spirits. The secluded, traditional log cabin in the Smoky Mountains of Tennessee provides 2 bedrooms with rustic decor, 2 bathrooms, and wraparound porches that allow you to rest outside and enjoy the spectacular views of the Smoky Mountains. Still want to stay connected? 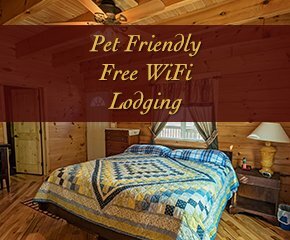 The log cabin features free Wi-Fi for your convenience, even in a remote location in Sevierville in East Tennessee. It's the perfect destination if you're truly looking to get away from the city to simply reflect and relax. We take care of you. If you need anything, the staff is on property 24 hours a day to help. We provide the base camp you need. This vacation cabin is ideal for fishing groups, family fun, and more! Escape to the peace and quiet of our primitive log cabin situated in an isolated and amazingly beautiful area of the Smoky Mountains. No matter what season you plan to visit, breathtaking natural scenery, fresh mountain air, a plethora of outdoor activities await you! 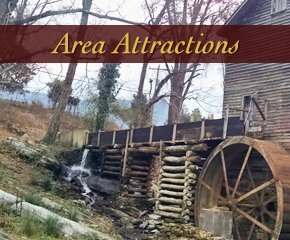 When you stay at this Sevierville vacation rental cabin, you will find outdoor activities at Great Smoky Mountain National Park and more. 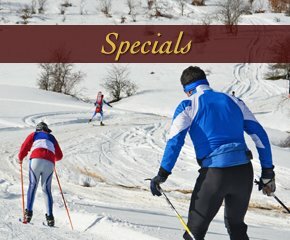 Fill your days with hiking, mountain biking, horseback riding, sightseeing. As the trees lose their leaves in the fall and winter, and water from the rain is not absorbed, the mountains will appear to smoke, hence the name "Smoky" Mountains. It's truly an incredible sight. Visit our blog for up-to-date information about road conditions.